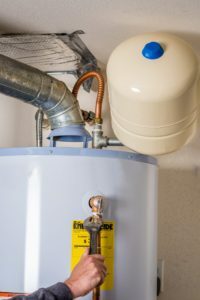 Water heater emergencies can be serious: causing a potential scalding hazard, damaging leak, or productivity standstill. If your water heater is on the fritz or it isn’t keeping up with household demand, Elek’s Lehigh Valley plumbers are available 24 hours a day to provide plumbing repair in Allentown, Bethlehem, Easton, and surrounding areas. Signs of a water heater problem? Have it inspected quickly before a costly, major breakdown occurs. The licensed technicians at Elek Plumbing service and sell all major brands of gas, electric, standard, and tankless water heaters and provide ongoing maintenance that prolongs the performance and efficiency of your home plumbing appliances. In some cases, your electric or gas water heater may just need to be flushed and tuned up. Like your vehicle, water heaters perform best with regular TLC. If your hot water heater is beyond basic maintenance or sediment removal, it may call for a more extensive repair. Elek’s Lehigh Valley plumbers are professionally licensed, extensively trained, and equipped to quickly restore hot water while preventing safety risks. Conventional water heaters have a lifespan of 10 to 15 years, depending on the model. If your water heater has reached the end of its lifespan, replacement is best since new tankless and storage water heaters use up to 20% less energy. If your water heater is fairly new, it probably requires a simple repair or an economical tune-up. Rest assured that the Elek Plumbing SuperSTARS will provide you with the details you need to make a safe and informed choice for water heater repair or replacement. Our award-winning plumbers can also help you choose a water heater that’s compliant with new National Appliance Energy Conservation Act (NAECA) efficiency standards. To report a water heater emergency, dial 610.432.7001 now. You can also request hot water heater service online, and an Elek team member will be in touch shortly to schedule a service call.